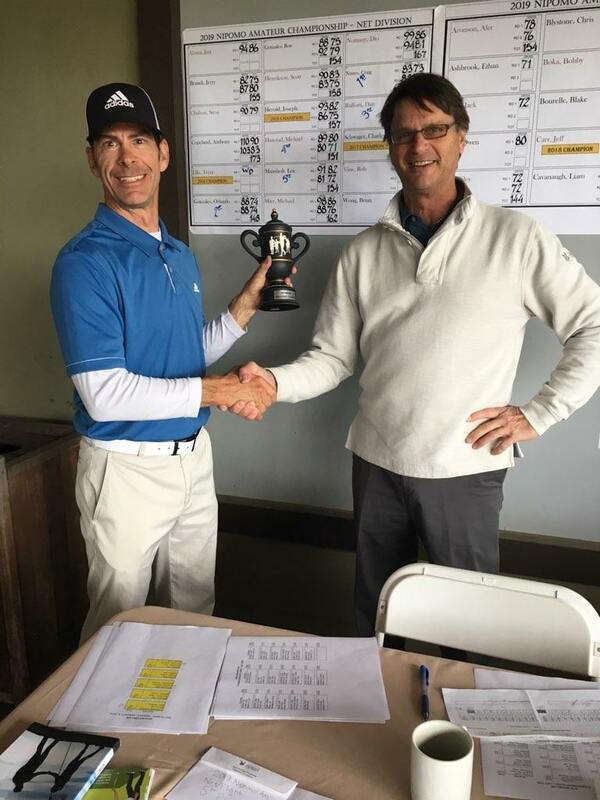 The Ninth Annual Nipomo City Amateur Championship at Monarch Dunes Golf Course was held January 5th and 6th, 2019. The field consisted of 58 players in the Championship flight and 18 players in the Net Flight. This year the rain came back with a vengeance! Saturday’s round had to end early as the course became unplayable. Well, unplayable for all except Brandon Gamma and Eli Poppers. Brandon and Eli played on through the rain and heavily puddled greens and fairways. They were both all smiles when they came in saying “We were feeling like Francis Ouimet in ‘The Greatest Game Ever Played’”! Remarkably, after 36 holes, they both finished tied for 11th, one shot out of the money! The weather improved on Sunday and by using an early shotgun start, everyone that continued play finished all 36 holes. In the Net Flight Craig Nunes kept it steady with net rounds of 73 and 72, for a two day net total of 145 in the difficult conditions! Three shots back was Orlando Gonzales with a two day net total of 148, followed by appliance man Dan Ruffoni with a two day net total of 149. 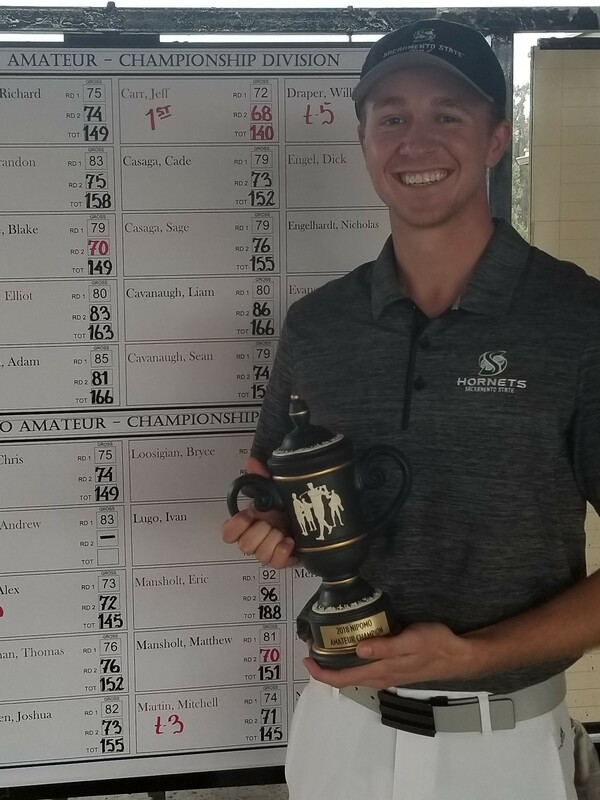 Michael Hunstad finished fourth with a two day net total of 151, which he achieved by shooting net 71 on Sunday, the lowest net score in the flight either day. The Championship flight players took on the course from the Black Tees and the course was playing extra-long with consistent rain early Saturday building to a day ending downpour in the afternoon. By 11 o’clock Sunday all players had finally finished their first rounds. William Draper’s opening round of 70 was the only score under par for the first 18 holes. Ethan Ashbrook, a local high school player, shot an opening round of even par 71, followed by Riley Bell and Jack Avrit, who both shot 72. 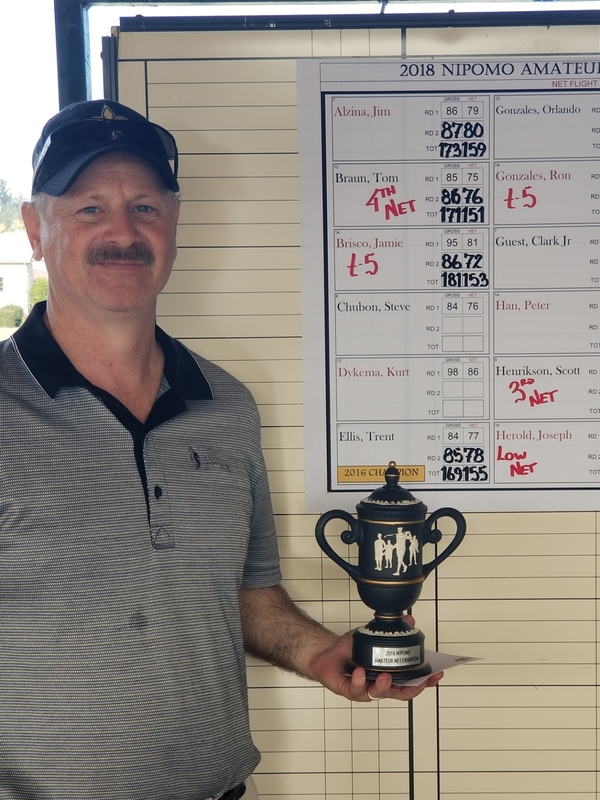 Defending champion Jeff Carr shot a first round 77, seven shots back of the leader, which proved to be too big of a hill to climb to successfully defend his title. Riley Bell matched his opening round score of 72 in round two, and Ethan Ashbrook came in with a 73 which tied the players for the lead with a two day total of 144. Last year’s runner up, and certainly a local favorite, Jack Avrit, played the final two holes of the tournament bogey, double bogey, to finish his second round at 73 just one shot out of the playoff with Riley and Ethan! 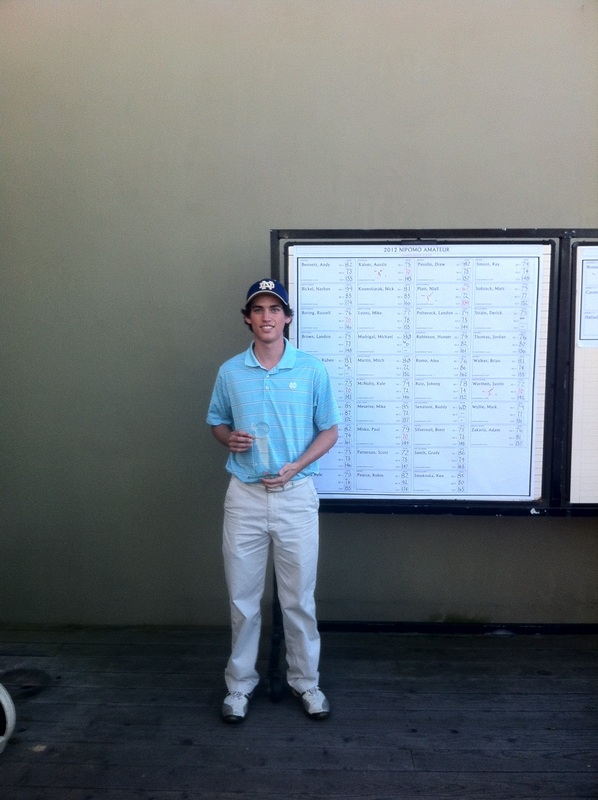 Jack’s brother, Owen Avrit, shot the low second day score of 70 which was the only score under par in round two. The only two under par rounds of the tournament were posted by Owen in the second round and William Draper in the first. Interestingly, and a bit unfortunately, both players shot 80 for their other 18 holes which put them in a tie for 7th at 150. The sudden death playoff took four holes to determine a winner. Both Riley and Ethan played some amazing and gutsy shots in the first few holes. Most memorable were Riley’s 20 foot putt on 18, the second playoff hole, and Ethan’s up and down from long right on 10, the third playoff hole, to a downhill green and tight pin. On the fourth playoff hole Ethan hit his towering tee shot with a slight fade around the trees, while Riley hit a 2 iron over the bunker on the right to a perfect position. Unfortunately for Ethan, his tee shot could not be found and the stroke and distance penalty turned out to be too costly and he wasn’t able to match Riley’s solid par to win. Both players performed beautifully for 40 holes and if not for the lost ball, we might still be out there trying to break the tie! What a fun and exciting tournament with a strong field of collegiate and other top amateur players from all over California and surrounding states. 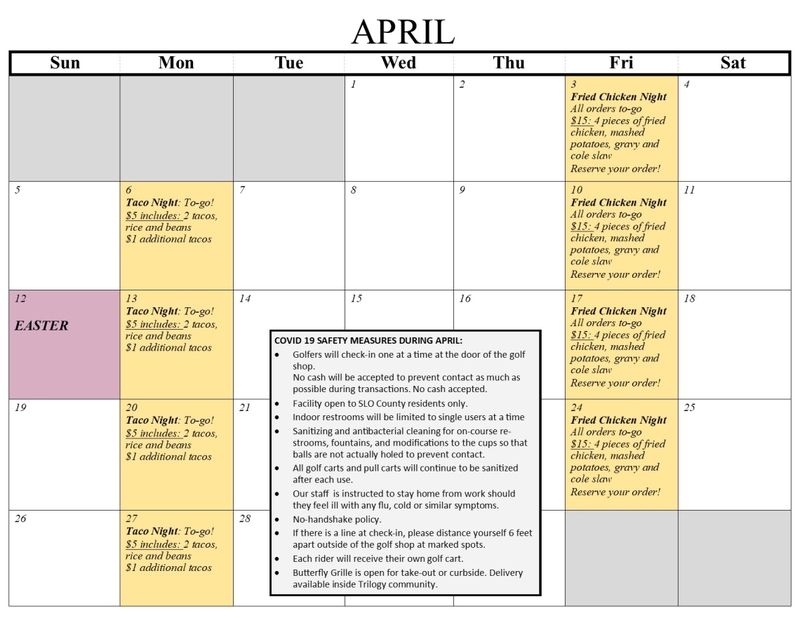 The Tenth Annual Nipomo City Amateur Championship at Monarch Dunes is tentatively scheduled for January 11th and 12th, 2020. We are hoping that by moving it back a week, we may get a little bit better weather, and certainly a little more daylight would be nice. Hope to see you there! Another Nipomo Amateur has come and gone. But not in such short words... This was a long weekend! Patience was a virtue this time around.The rain beat down, the wind pushed around, the greens and pins mentally and emotionally broke down players. A true test to the game as its meant to be played. Ball striking, mental stability and emotional calmness was a must. No one had them all, more than the champion Tim Snyder.Playing out of CSU Nothridge he brought every aspect of his game and claimed the 2016 title. With players falling off and mentally giving up. The scoring averages were around 81, 76. But Tim proved it could be done. Staying within himself, with perfect balance during each swing. Reading greens to perfection and a showing consistency with rounds of 73, 72. He capped off the weekend beating Ryan Roodvant in a one hole playoff with a par 4, on number 10. Congrats to Tim, the 2016 Nipomo Amateur Champion. For his spectacular play in such difficult conditions! Windy conditions made the game tougher than it already is. 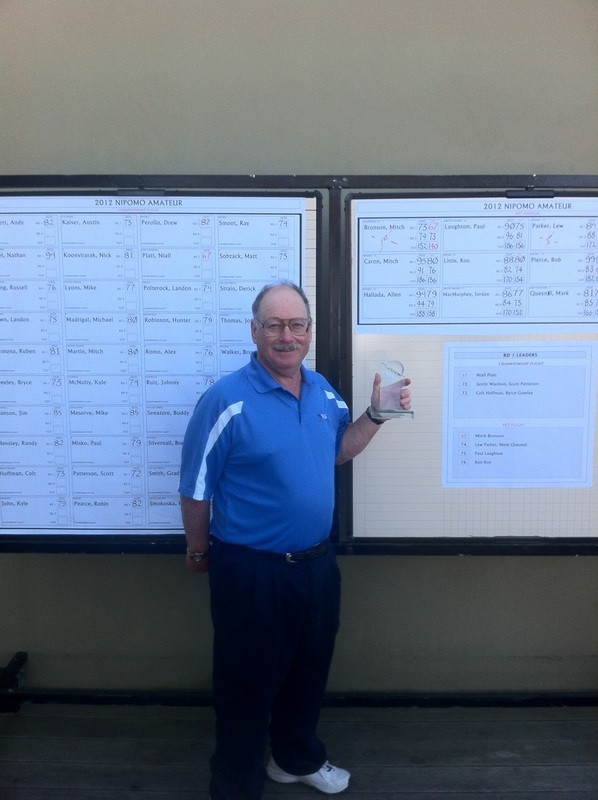 It was a two day event that demanded good ball striking and Santa Barbara local Brett Silvernail had it. Firing a solid 68 the first round and following it up with a 73 to hang on to a single stroke victory over Joey Downey, Chris Doyle, Rory Doll and Johnny Hogan. Joey and Rory were the only two rounds under par the second day and undoubtedly applying pressure to the champ. Ecstatic for his win, smiling ear to ear while accepting the trophy, Brett Silvernail goes home a happy champion. When asked if he will return to defend his title, he says he will be turning pro to give the circuit a go. Good luck to you Brett! Monarch Dunes would like to thank all who participated and helped for the fabulous tournament and hope to see it grow bigger and better in the years to come. 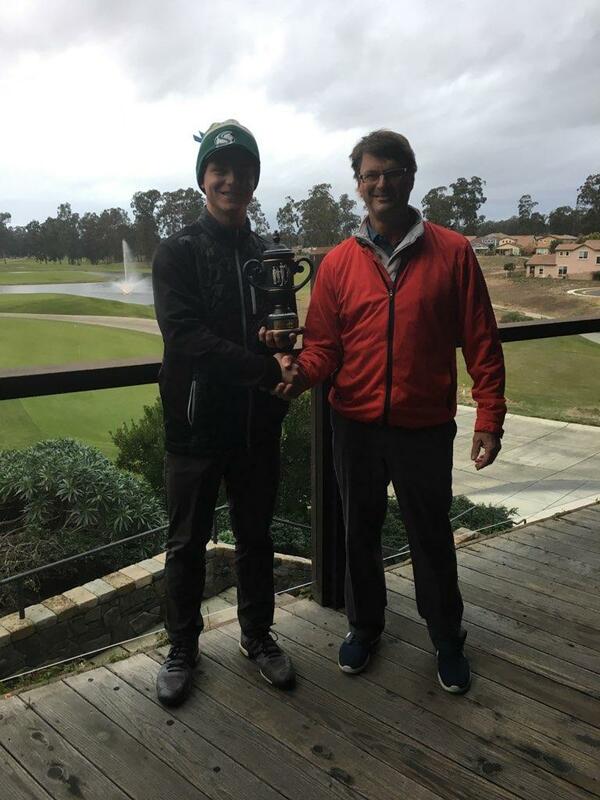 Another Nipomo Amateur, another exciting finish. Niall Platt had a comfortable five stroke lead after his stellar first round score of 67. Scott Patterson and Justin Warthen were tied for second with the first round scores of 72. Five strokes is a lot of ground to cover when chasing such a high caliber player like Niall. Scott started the day with several solid iron shots but couldn’t get the putts to drop. That’s how the day went for Scott. Justin made a late charge, gaining four strokes on holes 14 and 15 to get within one shot of Niall, with three holes left. Only to falter with a pulled four iron ricocheting off the cart path on the par 3, hole 17, proceeding to make double bogey. That left Niall plenty of breathing room to take the victory, but not before throwing in his own drama. Niall stripes three wood into the water on 18. Forced to drop at a cost of one stroke, puts his next iron shot about 15 feet. Keeping his composure and showing determination, Niall rolls in his par putt to win by 3.